The European Investment Fund (EIF) and 16 Bürgschaftsbanken have signed a COSME guarantee agreement in Germany benefitting from the support of the European Fund for Strategic Investments (EFSI) through which the Investment Plan for Europe is deployed by the European Commission and the EIB Group. The COSME agreement will allow Bürgschaftsbanken to support EUR 670 million of loans to over 4,000 German SMEs in the agricultural sector over the next three years. Bürgschaftsbanken would team up with Rentenbank to offer a 60% guarantee on loans targeting SMEs in the agricultural sector for the first time. The guarantee will be backed by a counter-guarantee from the EIF, provided under the COSME programme with financial backing from the Commission. European Commissioner Elżbieta Bieńkowska, responsible for Internal Market, Industry, Entrepreneurship and SMEs, said: “With this new agreement, we are putting the money where it matters. This agreement makes it easier for entrepreneurs in the agricultural sector to access credit and to grow their business for the benefit of Europe’s citizens. It will also increase their competitiveness and contribute to jobs being created in Europe. This agreement can help our agricultural sector to blossom and truly become an engine for growth”. Commenting on the signature, EIF Chief Executive, Pier Luigi Gilibert said: “I am pleased to be signing this EFSI SME counter-guarantee agreement in Germany under the COSME programme. I am strongly convinced that we will be, together with Bürgschaftsbanken, able to support German SMEs in the agricultural sector with limited or no access to finance to grow their business and create jobs”. This is one of the first COSME transactions in Europe signed thanks to EFSI support. The deal reflects the EIB Group’s commitment to respond swiftly to calls from Member States, the European Commission and the European Parliament for a rapid launch of concrete initiatives under EFSI, accelerating lending and guaranteeing transactions capable of boosting jobs and growth in the EU. 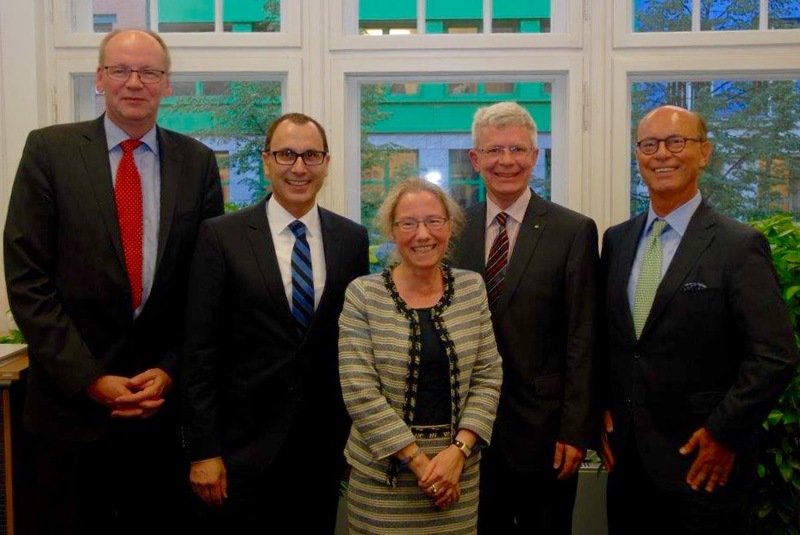 From left to right: Bernhard Krüsken (General Secretary of Deutscher Bauernverband (German farmers´ association), Guy Selbherr (President VDB), Christa Karis (Head of Corporate Relations, EIF), Manfred Thivessen (Vice President VDB and manager of Bürgschaftsbank North Rhine-Westfalia), Dr. Horst Reinhardt (spokesperson of the board of managing directors at Rentenbank).